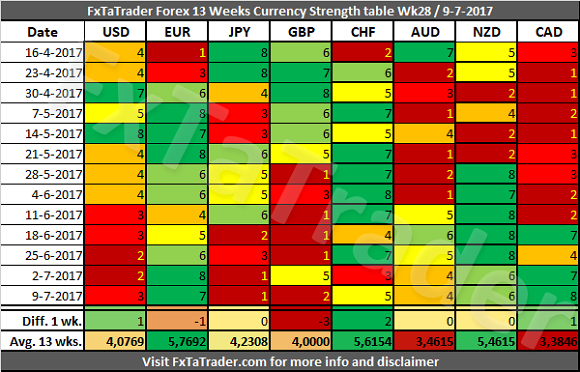 In the Currency Strength table, the EUR was the strongest currency while the JPY was again the weakest. There were some changes last week with the GBP losing 3 points and the CHF gaining 2 points. The other currencies remained around the same level of last week with a maximum change in the strength of just 1 point. There were a lot of classification changes last week and these are analyzed in more detail in this article. When looking at the Average 13 wks. Score we can see that the EUR, CHF and the NZD are clearly grouped together as Strong currencies. The AUD and the CAD as Weak currencies and the Neutral currencies are the USD, JPY and the GBP. The latter has been 6 times weaker than the CAD, in the last 13 weeks, which is a Weak currency! 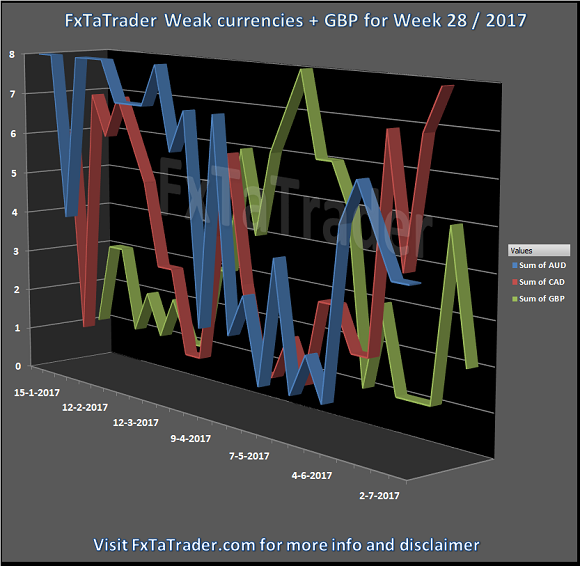 This week we take a look at the Weak currencies and the GBP. As can be seen in the chart below the GBP is showing weakness lately. It was the weakest currency in the last 5 weeks. If the currency remains this weak in the coming weeks it may become a Weak currency. The AUD and the CAD are showing strength lately. The CAD is even the strongest this week. 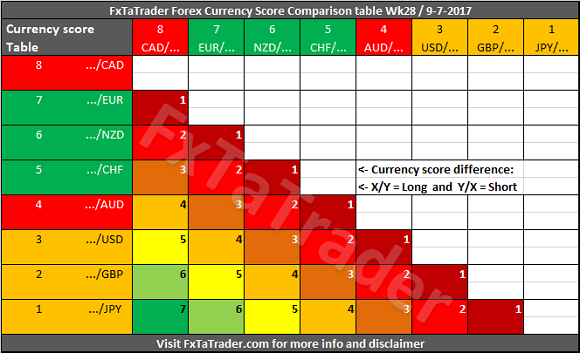 Both currencies are still too weak to become a Neutral currency in the coming weeks.Below you can see the Weekly Currency Score Chart with the 6 months' data as a reference. The points here below has been updated on 5 July 2017 to provide more trading opportunities. The difference between point 2 and 1 is that the long trend is not clear with 2 equally qualified currencies. These are both Strong currencies so that pair is in a side-way market. For that reason, the Currency Score difference cannot have a negative difference. A positive difference confirms the momentum for a short revival. JPY, GBP, USD and AUD.